Yoga. It’s a long time since last practice but this morning we did some in the hotel room before breakfast. Much needed. We went down for breakfast with a lot of time before we would be picked up. Not that it helped in any way as the Italian group who has invaded the hotel had managed to occupy every working staff member at the hotel. Fifty minutes later we had been served and was ready to move out. The pickup is right on time and we move down the street to pickup Trond, Yvonne and the kids. Then we start the one hour and a half ride toward Beng Mealea. We kill time in the car by talking and time flies. It’s chill to get to know other people and Trond and Yvonne are adventurous and interesting to engage over conversation. The kids behave better than I did at their age. Not that that necessarily says a lot. 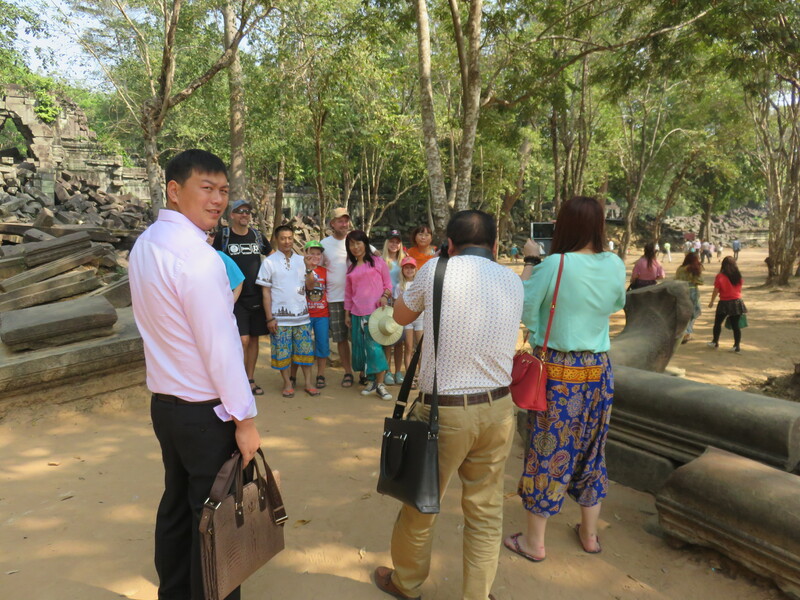 Beng Mealea is a temple well outside the normal Angkor park and I thought it would be less crowded. Not so. There where buses lined up outside and it’s clear it’s within the travel limit of a lot of people. 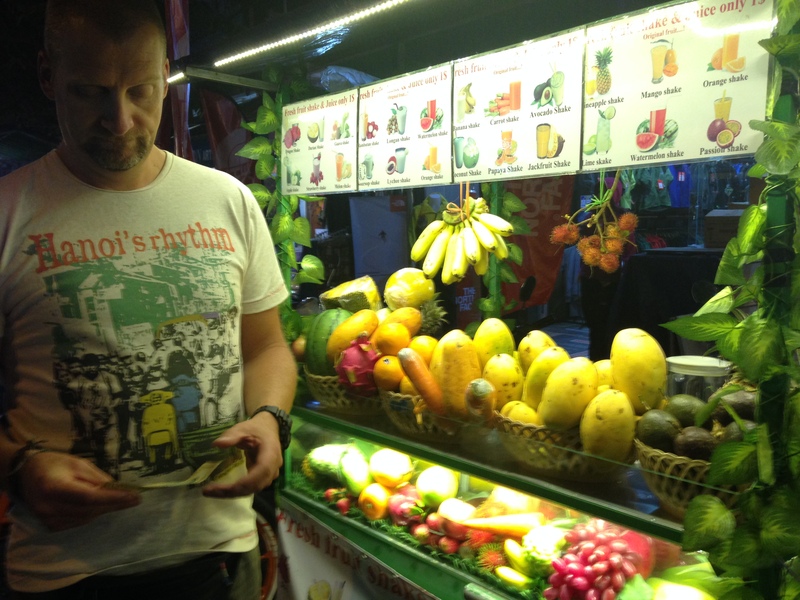 Trond had told us about his need-to-eat syndrome. The one that kicks in when the blood sugar gets too low. Sounds like someone we know already? Yeah? I’ve been living with that Dragon for a lot of years now and I’m not a saint myself either in that regard. As we stepped out of the van at Beng Mealea the first thing he sees and commented on are the restaurants across the street. “Now we know we can get something to eat afterwards”, he exclaimes, and Katja and he dances down the road to the temple hand in hand singing happily. The temple at Beng Mealea is one where you can touch the carvings, stones etc. I’ve secretly been wanting to touch the stone head of the Naga. Now that I have, I understand the pull it has had on me. The temple is in ruins and there are several places where we’re not allowed to go, but they have built a nice pathway throughout the temple. We deviated from the pathway when we met a bus load or two with Koreans, moving against the current flow of people all moving in the same direction. This collision gave us an excuse to go of the path and suddenly we found ourselves in a much more quiet place. We walked and talked and discovered (thank you Google) that this temple was built at the same time as the earliest Norwegian stave churches. If you were a nerd in school and did extra curriculum activities you might know that’s around 1150 CE. We get to take some cool pictures and not to forget that some of the Koreans’s wanted to take pictures with us. I’ve encountered this before because of my height, but when the girls have blond long hair I guess they’re the target of attention today. Big. Just, you know… BIG! We got out of the temple after maybe two hours, and nobody was in any doubt as to what was next on the agenda. We sat down at one of the restaurants and ordered. Mostly the food was good, but Yvonne got a mango salad that was so drenched in fish sauce everyone at the table flinched. Not edible, unfortunately. Other that that I think it all went well. Back in the van, another hour and a half and we’re back in town at our hotel. We make arrangement for dinner together this evening and they drive off. Then I realize my favorite cap is missing. The light blue that make me look good even with the cap on backwards. Noooooooooo! It’s fallen out inside the van. We try calling the hotel they stay at to see if they can hail the driver. No luck there, ai ai ai, how will this end? Before dinner we drive down to the mini bus area and find the guy we booked today’s tour with. We had been taken around by his brother, which he calls. Turns out the cap us in the car and that it will be brought down here. We agree to come back to pick it up later. Oh joy! 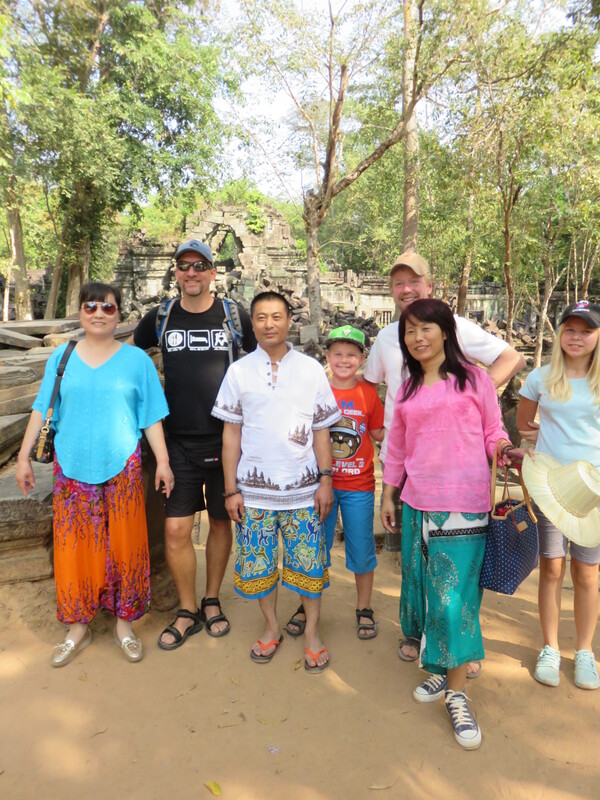 We met Trond, Yvonne and the kids at their hotel and walk to the center of Siem Reap for dinner. We end up at a great place in Pub Street that serves a variety of food and everyone gets what they want, except me. Not really, but a cold beer would suite me right now. I drive by a strict rule though; no drink and drive. So I guess a Sprite will do. After dinner we take a short walk and get tips for tomorrow’s dinner at a kebab wagon and we say goodbye to our new friends. It’s been a great day together with them and in today’s digital works we’re already hooked up on Facebook and can keep in touch that way. If all the pieces of the puzzle falls into place we’ll see them again in Thailand later this year. On the way back we buy a fruit juice and start moving toward the hotel where they stay and we have parked the motorcycle. There we met Trond and Yvonne again sitting out on the balcony, we spend another half hour chatting before heading toward our own hotel. On the way we pop on on a local shop and buy two beers and to soda water. Three dollars. Guess we found the store you talked about, Trond. Back home we uploaded pictures and got ready for bed. Another sunrise to be seen tomorrow. It’s a big difference on losing and being a loser.